Space Stationery: Set that looks like the Space Shuttle. When it comes to completing a space voyage, you can only afford the most practical, no-frills equipment around. When it comes to completing homework, though, it helps to have some fun. So to feel like a stellar scribe, Space Stationery is a set of pens, pencils, eraser, and ruler to equip you for the mission. The set is styled like a Space Shuttle with a rubbery eraser shaped like the orbiter, a four-color pen serving as the external tank, and two pencils making up the solid rocket boosters. 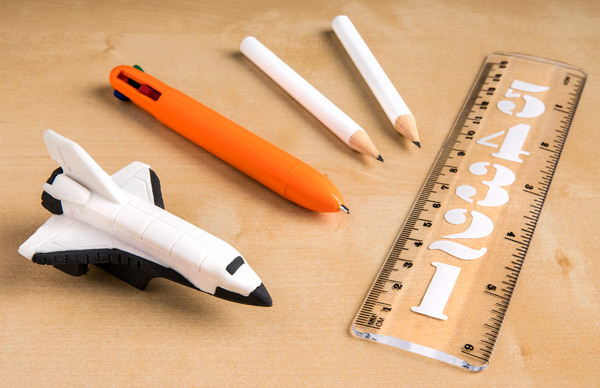 Kids and adults alike will be over the moon with these astronaut-themed desk accessories. Space Stationery supplies your writing endeavor with pens and pencils to go the distance, an eraser to correct your course, and a ruler to chart your progress. The components of the shuttle fit together to make your workspace a place where inspiration and hard work stand together as a monument to human progress… or the start of your grocery list. The pieces assemble to form a Space Shuttle! It's not just counting down the seconds 'til launch; it's also counting the number of pieces in this set. 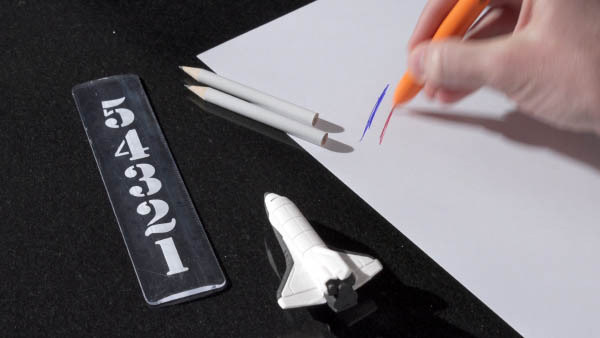 The Space Shuttle assembly is made of an eraser, 4-color pen with black, blue, red, and green inks, and twin pencils. 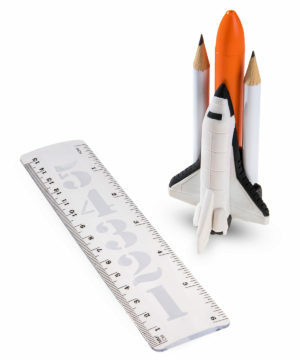 Space Stationery additionally comes with a 6-inch (15 cm) plastic ruler with a countdown printed on it. Question: How does the four-color pen work? Answer: There are separate ballpoint cartridges in black, blue, red, and green that slide down and click into place. Moving a different slide retracts the ballpoint back into the body of the external tank. Question: Will civilians ever get to explore the solar system? Answer: We sure hope so.